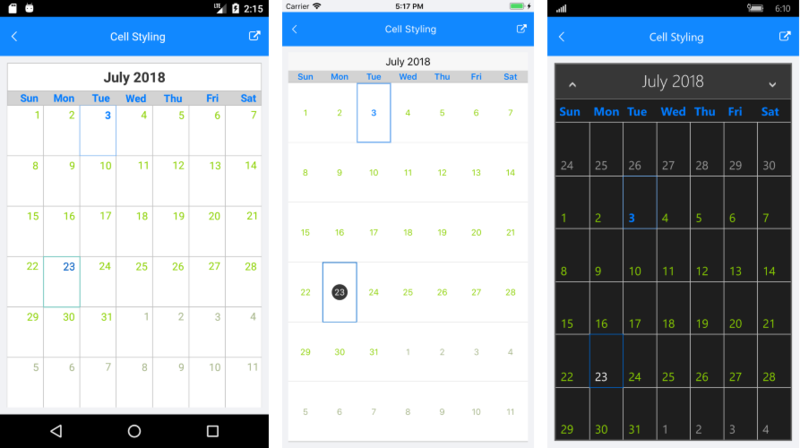 This article describes the APIs used to customize the look of the calendar cells. The RadCalendar component exposes a property which enables you to provide a custom style for each cell. SetStyleForCell (Func<CalendarCell, CalendarCellStyle>): This property should be assigned to a method that provides a CalendarCellStyle for each calendar cell. The CalendarCell objects are not actual visual elements, but they provide context that the user can use to style different parts of the calendar. Here you can find more information about the calendar visual structure. Text (string): Gets the text displayed in the cell. Below are described the specific calendar cells and their properties. These cells hold date values (days, months, years). The Type of CalendarDateCell is Date. IsEnabled (bool): Gets a value that specifies whether the cell is enabled (inside the calendar MinDate and MaxDate range). IsSelected (bool): Gets a value that specifies whether the cell is currently selected. Date (DateTime): Gets the date that corresponds to the cell. These cells hold dates in Month and Week view. The CalendarDayCell inherits from CalendarDateCell and its Type is also Date. IsFromCurrentMonth (bool): Gets a value that specifies whether the cell is from the current month in month view. IsToday (bool): Gets a value that specifies whether the cell date is today. These cells hold elements different from dates: week numbers and week day names and correspondingly have Type WeekNumber or DayName. FontWeight (FontWeight): Bold or Normal. This example demonstrates how you can apply styles to different calendar cell types.